First responders from the Council Bluffs Fire Department in Iowa had an exceptional opportunity yesterday to undergo flight training and learn flood rescue techniques in their new 6-passenger Neoteric Rescue HoverTrek. HTC flight instructors Chris Fitzgerald and Steve Stafford conducted their training on the Wabash River, now at 22.8 ft. flood stage. as Council Bluffs’ first responders begin their training. A structure near the Wabash River is nearly covered with water. 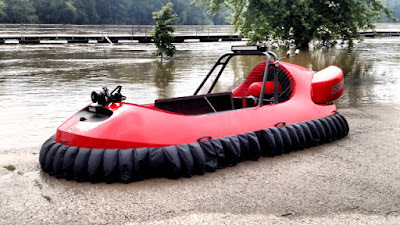 Sornson is correct – their new hovercraft is a great asset for their city. 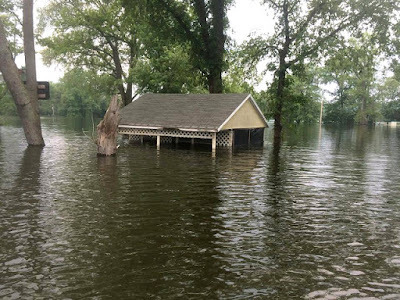 When Chief James said the flooded Wabash River reminded him of 2011, he was referring to a summer of massive floods in Council Bluffs, so severe that the National Guard had to be called in to assist with hundreds of rescues. Dozens of homes and other structures literally collapsed in the torrential rains and flash floods. And Neoteric’s Rescue HoverTrek, with its patented reverse thrust, easily and safely operates in debris-filled floodwater and has the unique maneuverability for up-close access to victims without forcing first responders to enter the water. 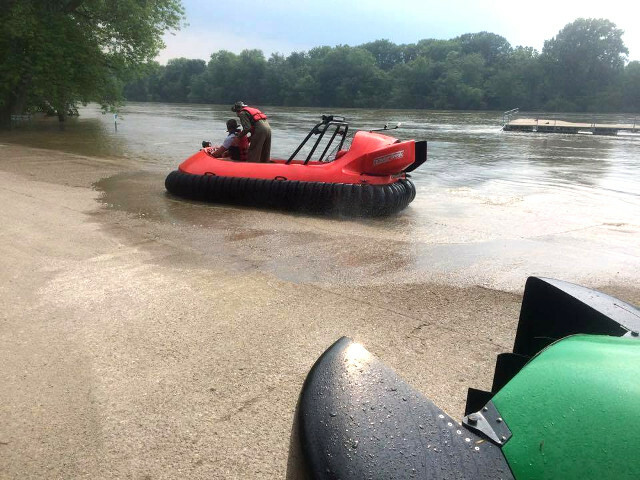 Council Bluffs Fire Department’s new 6-passenger Rescue HoverTrek at the flooded Wabash River.